Another boring postcard in a boring series. 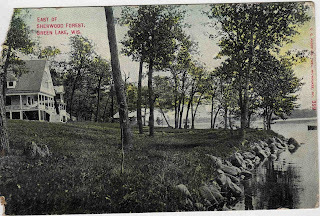 This one is an image "east of Sherwood Forest" on Green Lake, WI. 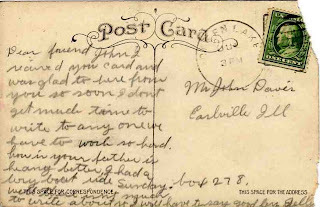 Postmarked July, 3 PM (no year is listed, but I know it's 1909 as I have another postcard from the same sender and being sent to the same recipient a few months later - both have the same stamp). At least this writer had more to say than Visiana did in the last postcard. *I can't make out the name on either post card, so I'm naming the sender "Bella"